I’m torn between wanting to buy my daughter all the cool toys that are out there for her and wanting to take all of the toys she already has and throw them away. Our house is just not that big! It’s a well-known fact that not all toys are created equal. Some fall apart after very little usage. Some are fun for a few hours and then lose their appeal. Some only work for your child until she grows or progresses somehow, which we all know happens a lot and quickly. So how do you know which ones are worth it? 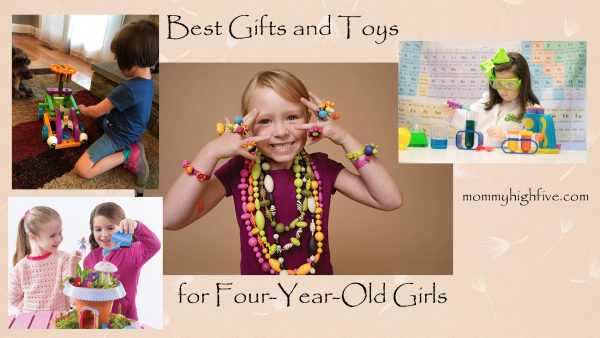 You read this list of awesome toy ideas for 4-year-old girls, obviously! So go ahead; take advantage of the fact that we did the research for you. With the prevalence of tablets and other electronic devices, we need all the help we can get to shove our kids out the door and force them to get some fresh air and exercise. These products are guaranteed to do just that. Every time my daughter sees a kid with a scooter at the park, she runs over and follows them around like a lovesick puppy. I think she’s finally ready for her own! 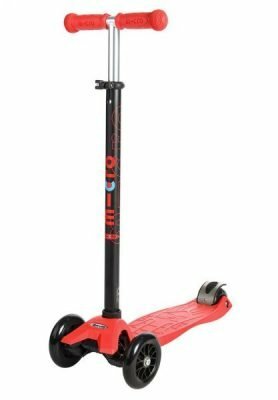 The best scooter option for a 4-year-old is this one from Micro Kickboard. While it is definitely pricier than many of the other options, it’s also build to last. Every part of this scooter is replaceable in the event that something breaks, and the age limit extends all the way to 12 years (or 110 pounds). Now that’s an investment! The Micro Maxi offers a really smooth ride, and its three wheels make it very sturdy. This is particularly important for new riders! You can choose between two steering options–a joystick for a more skateboard-like ride or a T bar for increased balance. There’s also a brake in the back for those inevitable quick stops. 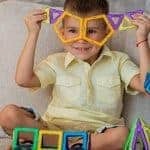 While the product says it’s designed for children 5 years or older, many users have reported buying it for children as young as 3 with no problems. If the price is a deal breaker for you, try out the more affordable LaScoota, which also boasts a weight limit of 110 pounds and a three-wheel design. 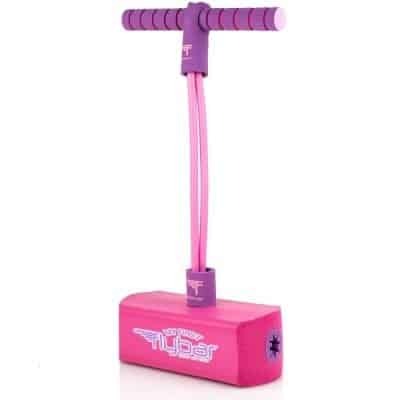 There’s something so classically entertaining about a pogo stick, and this one from Flybar adds many fun, innovative twists. The bottom is made of a soft but sturdy foam, and the middle section stretching up to the soft foam handles is a stretchy bungee cord. Because the base is made of foam, this pogo works well indoors, too, and it won’t scratch your floors. A built-in squeaker makes a fun noise every time your child jumps though, so maybe you will want to keep it outside. With this little pogo stick, your preschooler will get the exercise she needs while building up her strength and balance. And amazingly, it holds up to 250 pounds, so you can feel free to take a jump on it yourself–if your daughter ever puts it down! Now that they’re past the wobbly toddler stage and coming into their own athletically, 4-year-olds are ready to participate in the time-honored childhood pastime of roller skating. 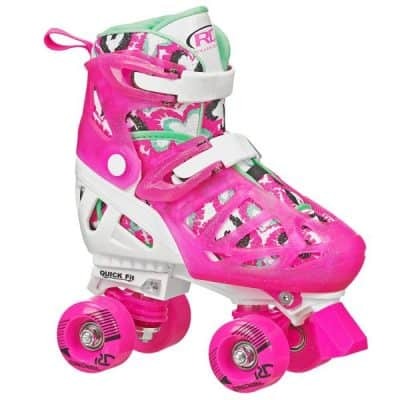 But because they’re still growing so fast, roller skates can kind of feel like a bad investment. Won’t they just grow out of them in a few months? That is the problem solved by these cute adjustable skates that grow as your preschooler does. With the simple push of a button, these skates can grow a few sizes for extra comfort and longer use. The inside liner of the skates is also removable for easier cleaning. Just say no to stinky foot smell! The skates are fastened with buckles, so they’re perfect for young kids who can’t yet tie laces. The sturdy polyurethane wheels can also be tightened to spin a little slower, allowing beginning skaters a chance to get their bearings. And when they need it, there’s a big, chunky brake in the front to help them stop. When we go to the park, my kids usually want to spend the whole time on the swings. It would be so great to have a swing like this one at home and save myself the drive! 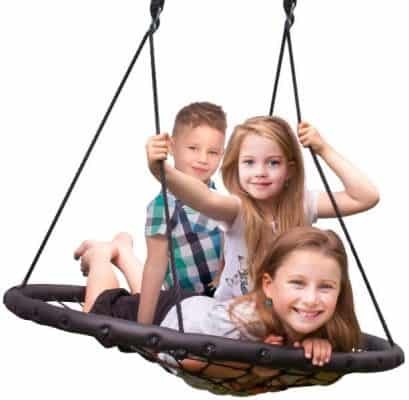 This rope seat swing can be hung from a tree or an existing playset, and it’s easy to assemble. Your child can swing alone or with a couple of friends, as long as their combined weight doesn’t exceed 220 pounds. The rope seat is made from thick nylon, and the frame is a sturdy steel construction. The ropes stretching up to the top have steel rings for extra safety and support. Measuring approximately 63″ long from top to bottom and 40″ wide, this swing is the ultimate in outdoor fun, whether your child is twisting, turning, and spinning or simply relaxing with toys or her favorite book. All it takes for your 4-year-old to launch this fun foam rocket is the power of her own stomp. (And if she throws stomping tantrums like my daughter, she’ll make it go super far!) She can simply run, jump, and stomp on the launcher to send one of the four rockets flying as high as 100 feet in the air. 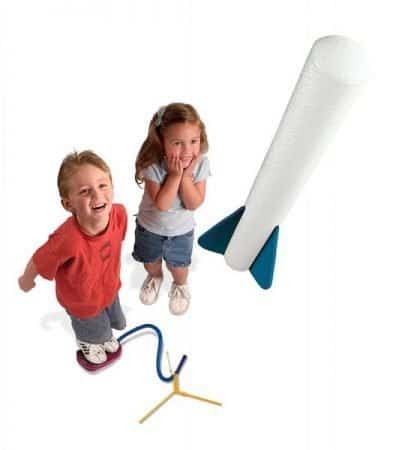 As the winner of several toy awards and a favorite of parenting magazines, this simple rocket set can provide hours of entertainment while opening the door for important learning conversations about gravity, force, trajectory, and more. This toy requires no batteries and is incredibly easy to set up. 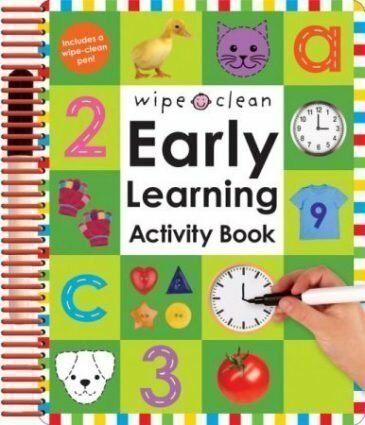 Once you’ve put it together, your child will have no trouble using it without your help. It also glows in the dark, making for a spectacular night show. Just stay away from trees! What little girl doesn’t want a play house of her own? My father-in-law just built one for my daughter, and now she disappears into it for hours whenever we go visit! It’s wonderful. But for those who can’t (or don’t want to) build their own–it is quite the project–there’s this cute little patio playhouse from Step2. 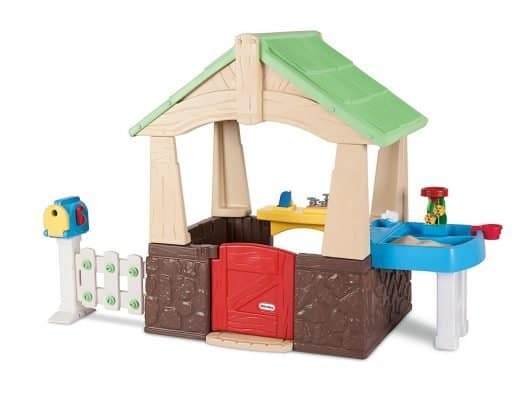 In addition to a pretend grill with clicking knobs and a snack table for serving pretend (or real) food, it also boasts a sand and water table for extra outdoor fun. The set includes the sand and water toys as well as a pot, a pan, cups, dishes, and grill tongs, though you would need to buy any play food separately. The sand table comes with a cover to keep out unwanted critters, and a canopy over the top provides nice shade. At 47.5″ x 47.5″ x 60″, it’s large enough to accommodate your child for years to come! I’m not sure if it’s all 4-year-old girls or just mine, but my daughter will spend hours doing arts and crafts at our kitchen table. I know she–and your own crafty kid–would be all over these fun and creative activities. The great thing about this gift is that it provides so many options! Inside the box are buttons, dough, crayons, doilies, fabric flowers, feathers, googly eyes, paper bags, pipe cleaners, plastic frames, stickers, crinkly paper, tissue paper, and glue. There are 16 different projects to choose from in this box, and they fit into five categories: dough animals, sticker art, animal collages, tissue paper projects, and paper bag puppets. Instructions are included for one craft in each of those categories. After that, it’s up to our child’s creativity to create the rest! If you’re looking for a good sample of different types of crafts, this is the kit for you. It’s more affordable than buying several small kits, and it will last your child much longer. This stamp set is perfect for preschoolers. They have the imagination to create beautiful pictures in their minds, but they lack the dexterity to bring them to life. Stamps bridge the gap between the two. 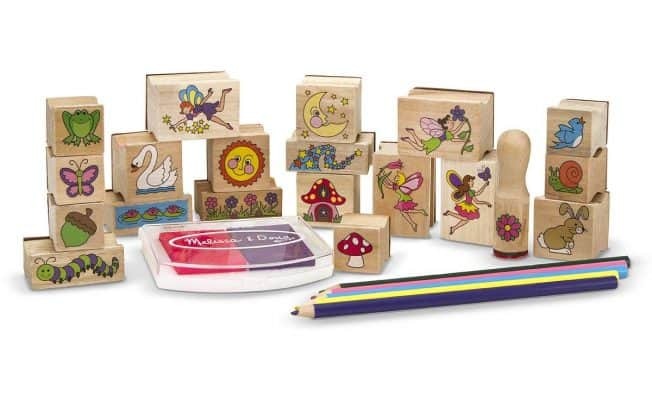 With this particular set, kids can create a fairy garden with 20 wooden stamps, a two-colored pink and purple ink pad, and five colored pencils to fill in the pictures. The stamp images include four fairies, a sun, a moon, foliage, insects, and animals. Your 4-year-old will foster her creativity as she creates story after story using these images. The stamps are made from high-quality rubber and have contoured wooden handles that are easy for small hands to grip. The set also comes with a wooden tray for easy storage. Little girls love their accessories, and they’re even better if they’re designed by the girls themselves. Unlike most other jewelry making sets–of which there are many–this kit allows your child to build and rebuild unique pieces over and over again. Each kit includes anywhere from as few as 50 to as many as 500 snap-together pieces in varying shapes, sizes, and colors. The bracelet, necklace, and ring possibilities are endless! And each creation can be unique every time. The beads are easy to snap together and pull apart, and your child will gain fine motor skills and stronger fingers as she plays. They are made from sturdy phthalate-free PVC and are BPA-, latex-, and lead-free for safe play. One of my daughter’s favorite ways to craft is to make cards for people. Just the other night she decided to make cards for some neighbors we don’t really know! 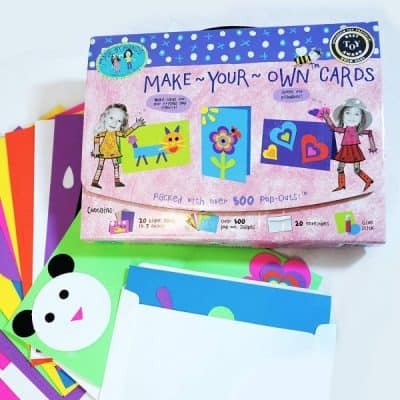 This card-making kit is perfect for fostering her desire to make beautiful things for the people she loves. Included in this kit are 20 blank cards in seven different colors, more than 500 pop-out shapes, 20 white envelopes, and a glue stick. The pop-out shapes include triangles, circles, semicircles, rectangles, flowers, petals, and hearts, all in varying sizes and colors. The thick, quality paper is made from recycled material and is itself 90% recyclable. Everything comes with a Velcro-fastened carry case for storing leftover pieces for later use. What kid doesn’t like squishy stuff she can use to create a 3D masterpiece? And what mom doesn’t like a mess-free toy that will quietly entertain her children while she makes dinner? Unlike other clay and modeling dough, Playfoam doesn’t dry out and is not sticky. This makes it great for on-the-go fun. And because it is made up of several little balls, it also doesn’t turn a gross brown when the different colors are mixed. It stays pretty! 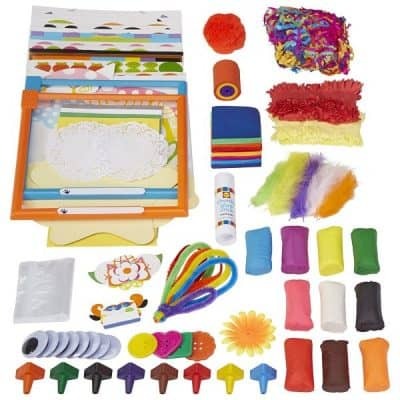 This set includes foam in eight colors–orange, sparkle orange, yellow, green, sparkle green, blue, purple, and pink. In addition to being fun to create with, it also provides a good tactile and sensory experience for your growing child. Nothing builds fine motor skills like individually placing tiny, colorful beads onto tiny peg boards. It may sound tedious, but kids love creating their own designs and watching the beads fuse to make those designs permanent. Plus the finished products make great presents for grandparents, cousins, friends, and other loved ones! 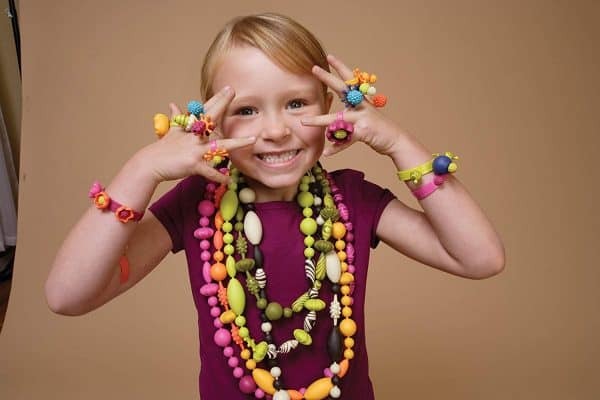 The way it works is that your child uses her fingers or tweezers to place the beads onto the pegs in the design of her choice. Once the design is finished, an adult places a hot iron over the design for just 10 seconds–Never let a child use an iron!–thereby fusing the beads together. This particular kit includes 6,000 colorful beads, ironing paper, and small pegboards in the shapes of a square, a circle, a hexagon, a star, and a heart. Both the peg boards and ironing paper are reusable, allowing your child to make hundreds of creations with just this one kit. Now more than ever, it’s so important to teach our daughters to love STEM. As someone who grew up thinking these subjects were beyond my understanding, I wish I’d had the following toys to prove me wrong. 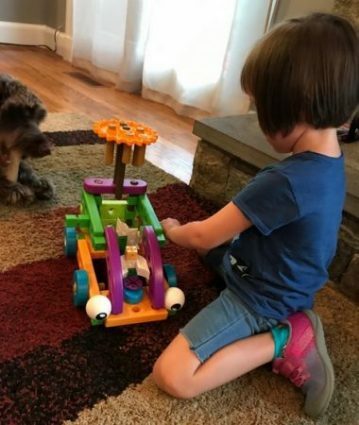 Goldie Blox is more than just a STEM toy; she’s also a character with a story, and I think that is important to many little girls. In this particular set, Goldie’s dog, Nacho, really needs a bath but refuses to take one. So being the smart, resourceful girl she is, Goldie designs and builds a dunk tank to force the pup to get clean. Each GoldieBlox box comes with a building set and a storybook to set the scene, and each teaches a different STEM-related concept. In this case, it’s hinges and levers. In addition to instructions for how to build the needed dunk tank, this set includes two additional building ideas for your child to experiment with. Your child will love the satisfaction that comes from building something that has a function and actually works. Plus she’ll get a kick out of watching Nacho fall and make a splash! This introduction to electronics is perfect for preschoolers. In addition to extra safety features, such as its patented CircuitSafe Fuse Technology, this set has simple, colorful directions with step-by-step diagrams to follow. No need to know how to read! Using 14 different parts, your child can create 20 unique projects involving various combinations of lights and sounds as well as activating a little spinner. There are no wires, just snap-on pieces that are easy for little hands to connect. 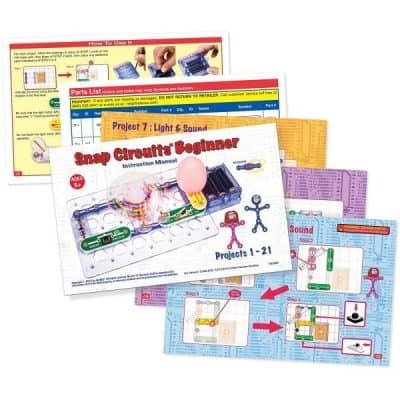 As your child experiments with this kit, she will learn the important skills of following directions and problem solving, along with the fundamentals of switches and circuits. Her confidence will grow as she experiences the success of creating her own light and sound with the flip of a switch. My 4-year-old has had this book for awhile now, and she loves it! And her dad and I love that it helps her sit quietly during church and sometimes even little brother’s naptime. This book is divided into four sections: letters, animals, time, and numbers. My favorites are the letter and number writing, though the animal tracing is good for practicing pen control and dexterity. It also has places where it asks you to count the number of animals, circle certain things, and perform other learning tasks. In the letters section are several lowercase and uppercase versions of each letter that your child can trace. Each letter is shown not only at the beginning of words but at the middle or end of words as well, which can help with phonics and eventual reading. In the numbers section, your child can trace not only the numerals but also the word forms of each number. 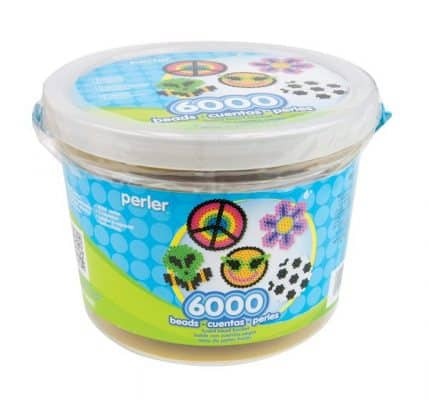 It also has several other counting and number-related activities. I credit this book with teaching my daughter to write her letters, which she continues to get better and better at. My only complaint is that the included dry-erase marker is not great. It’s worth it to buy a set of good ones for the hours of fun and learning that will come from this book. In today’s world, knowing how to code is so important. In the future, it may be essential. And it’s never too early to get your child started! 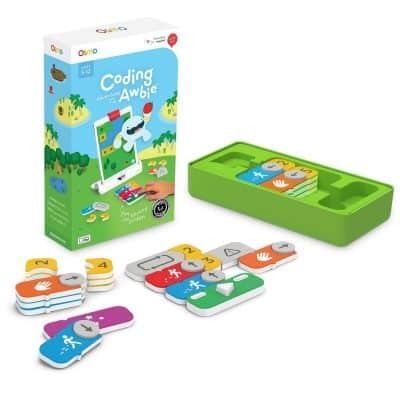 While true computer coding is obviously too complex for a 4-year-old, this game teaches the basic thought processes of coding, such as “if statements,” loops, logic, and problem-solving. You’ll need an iPad or iPhone to play this game, along with the the game box and the appropriate base (both of which are available on Amazon). The game starts slow and builds in complexity as your child begins to understand more. The company describes this game as being “like LEGO for coding,” because you simply snap blocks together. Each block represents a command, and snapping them together creates command sequences. But instead of building a website or something, the sequences control Awbie, a cute, chubby character who looks a lot like the chubby guy from Big Hero 6. Your child will love watching Awbie hunt down and then scarf down his favorite treat–strawberries! And she’ll be opening the door to a world of future coding possibilities in the process. Are you interested in getting your child into STEM but don’t know where to start? 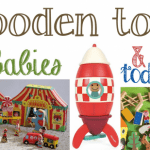 What toys are age-appropriate? Which ones will actually teach her something? With this Amazon-exclusive subscription, you can leave all of these decisions up to the experts. You can choose to receive a box with an age-appropriate, educational STEM-related toy every one, two, or three months. 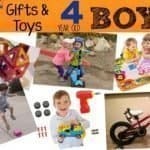 The toy experts at Amazon will select something great for your child and send it off with free shipping. When you’re no longer interested, you can cancel your subscription with the click of a button. Your child will love receiving a surprise package in the mail every month (or two or three), and you’ll experience the joy of giving her a fun, educational gift that keeps on giving. This spelling set comes with eight double-sided wooden boards and more than 50 colorful wooden letters. On each side of each board is a picture, accompanied by its corresponding three- or four-letter word cut into the wood. Some examples of the words are “cake,” “bus,” “fish,” and “pig.” Your child has to find the right letters to fit into the spaces and complete the word puzzle. In the process, she will learn to spell some basic words by sight. If you work on the puzzle with your child, you can also teach her phonetics and how to sound out words in preparation for reading. You can also use the numerous letters to teach her to spell her name or other simple words not included in the set. When they’re not being used, all of the individual parts fit nicely into a small, rectangular case for easy storage. 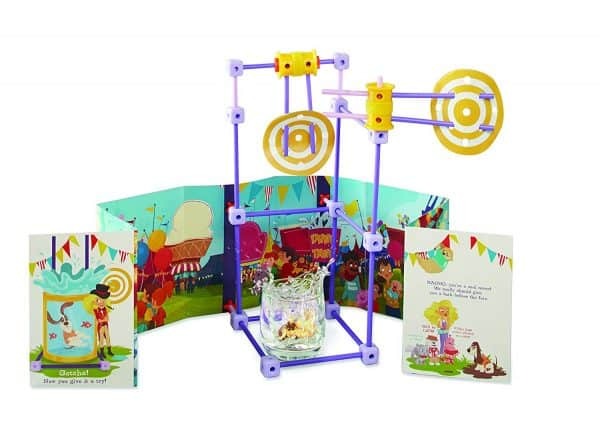 This little science lab set doesn’t just look cool; it actually works! Included in the set are a beaker, a funnel, a flask, a 6″ test tube with lid and stand, two smaller test tubes with lids and stands, an eye dropper, a magnifying glass, tweezers, and goggles. The set also comes with 10 double-sided experiment cards with simple, easy instructions. While none of the ingredients for these activities are included, you’ll find most of them in your home–food dye, vinegar, baking soda, lemon juice, cooking oil, raisins, dull pennies, and club soda. Once your child has done all of those experiments, there are 10 extra activities on the Learning Resources website. You can also Google preschool science experiments for more ideas. 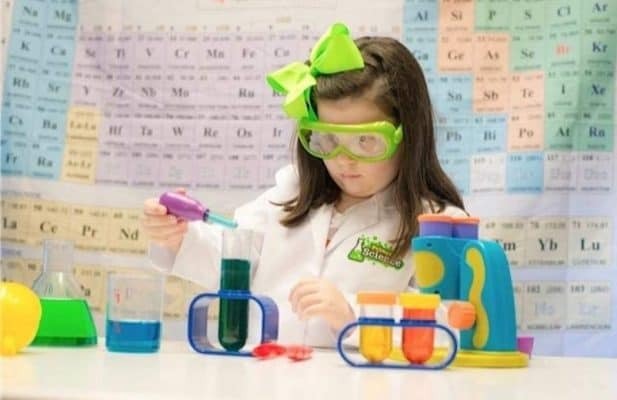 As your child plays, she’ll learn science terms as well as basic scientific concepts, such as cause and effect, making observations, using the senses, and more. Little kids love to play pretend, and it’s so good for them! They learn and grow by using their imaginations, and it can be pretty darn cute and entertaining to watch. 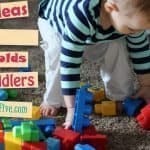 While kids can usually find ways to pretend without any accessories at all, there’s no doubt the following toys will bring their imaginative play to the next level. For some reason, it appears to be a favorite game of children everywhere to play ice cream shop. My kids either serve each other air or random objects and pretend they’re ice cream, but this is so much better! 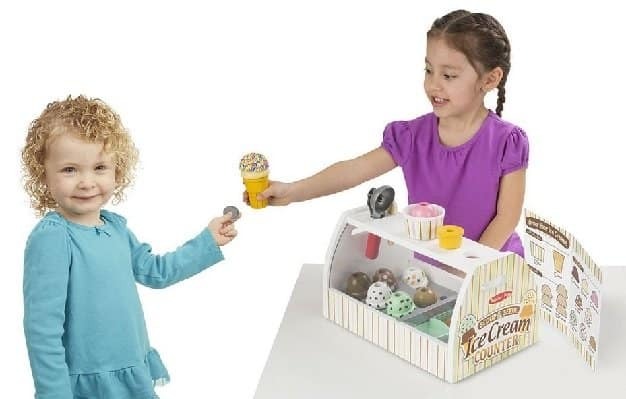 This set comes with two cones, a cup, eight scoops of ice cream in various flavors, six toppings, an ice cream scooper, tongs to pick up the toppings, a wooden spoon for sampling, pretend money, and a menu. The scoops fit in the bowl or stack on top of the cone, and the toppings fit snugly over the top. Everything is made of sturdy wood, and the ice cream scooper functions like the real thing. Your child can dig out a scoop, and it will stay in place until the small button is pressed to release it. The popularity of the Tinker Bell movie franchise is a great indication that little girls love fairies. I don’t know what it is about them, except maybe the magic, but I pretty much feel like every girl wants a fairy garden of her own. And here is one that includes a fairy who actually flies! With the help of an attachable cord, Freya the fairy can fly above her garden home and observe the goings-on there. 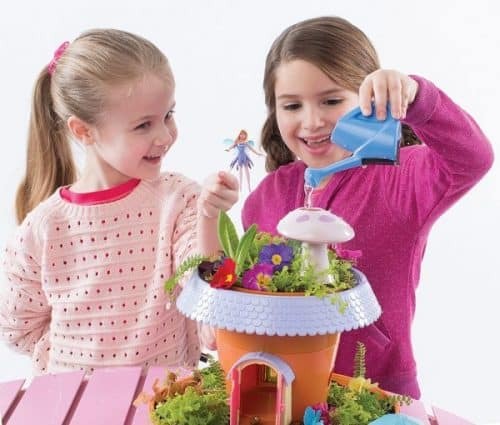 This kit also has everything your child needs to grow a real, miniature garden for her fairy. It includes seeds, soil, a watering can, a toadstool that trickles water, three gardening tools, an umbrella table with two chairs, and Freya’s chipmunk friend, Hazel. The all-organic plants are easy to grow, and some even flower. Among many other plants there are Forget-Me-Nots, Chicory, Endive, Garnet Red Amaranthus, Dill, and Red Giant Mustard. Your child will love to play pretend with her fairy in the lush, colorful garden, and she’ll simultaneously learn responsibility as she tends for real growing plants. To say my daughter is obsessed with this game is an understatement. For better or worse, she loves the Disney princesses. She also loves any kind of pretend food. Win-win! 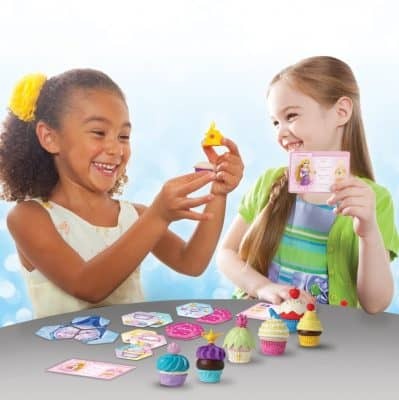 In this game, players take turns picking tiles and trying to collect all of the pieces they need to complete their cupcakes before the clock strikes midnight (of course). It’s a very simple game with simple rules, making it perfect for beginning game players. There are 10 cupcakes, one for each of the Disney princesses (though you should be warned that Anna and Elsa are not included), and 10 double-sided recipe cards. The pink sides are recipes for the traditional cupcakes designed for each princess, while the purple sides mix and match. My daughter loves playing the game, but she also loves just creating her own unique cupcake designs. The hours she has spent playing with this make it seriously one of the best presents we have ever gotten her. There’s something about little girls and tea parties. 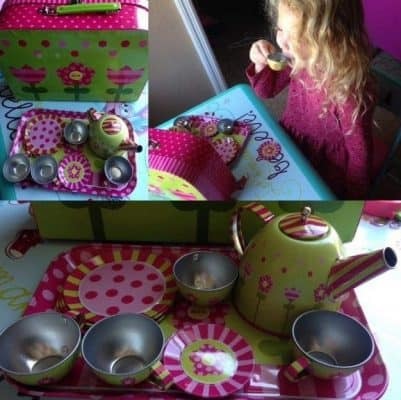 It’s a total cliche, but every little girl wants to have a pretend tea party. There are about a billion tea sets to choose from, but I love this one from ALEX Toys. It’s made from tin, so it feels much fancier and sturdier than plastic sets. The tin also makes it look more like a real tea set, only it won’t shatter into tiny pieces when it’s dropped. This set, which comes in an awesome carrying case with a handle, includes a teapot with a lid, four cups, four saucers, four plates, and even a serving tray. The floral design throughout the pieces is simple and wonderfully childlike–not childish, which simply wouldn’t do for the elegant tea party your child will, of course, be hosting. Should your child be interested in the real thing, the dishes can be used with real food and washed afterward. Just be sure to dry them well to avoid any rust! Even though my daughter hates going to the doctor, she loves pretending to be one! She loves making up silly illnesses and then nursing her fake patients back to health. I think it’s the nurturing quality that so many little girls have (and boys, too–my son is so wonderfully loving and empathetic) that draws them to this type of pretend play. Included in this doctor’s kit are many items your child will recognize from her own doctor visits, such as a thermometer, a syringe, an otoscope, bandaids, a stethoscope, and–a favorite of children everywhere–a blood pressure cuff. It also includes a reflex hammer, a tiny dentist’s mirror, surgical scissors, glasses, and a phone. 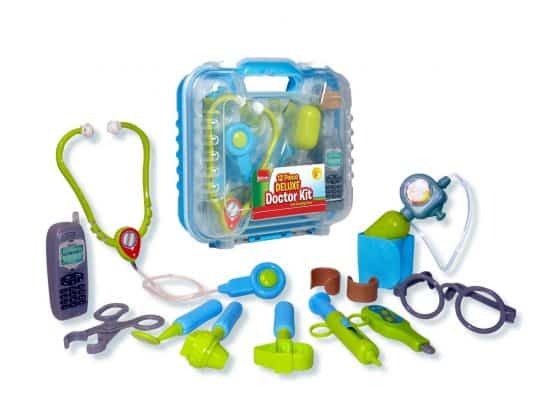 For added realism, your child can actually see through the otoscope, the phone makes ringing and beeping noises, and the stethoscope plays cough and heartbeat sounds when the button is pushed. Probably the best thing about this set though is that you can lie on the couch and still be playing with your kid! It doesn’t get any better than that. Kids have the greatest imaginations, but somehow their favorite way to play pretend is to copy what Mommy and Daddy do, no matter how boring it is. And so, for reasons unknown, pretending to clean is fun! 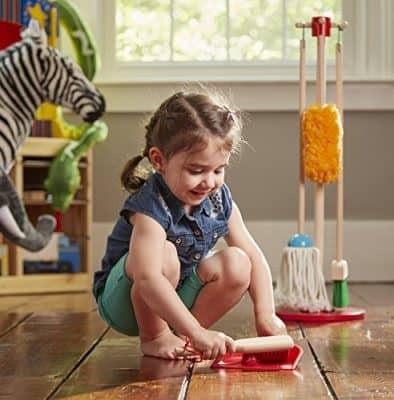 That’s why this dusting, sweeping, and mopping set is so popular among young kids. The duster, broom, mop, handheld brush, and dust pan in this set all have hanging ropes for easy storage on the included upright stand. The dustpan even snaps on to all of the handles, just like the real thing. And, with the exception of the mop, all the pieces can be used to do real cleaning. So put your kid to work!